Patients present to physicians with headache or facial pain and are certain that it is a “sinus headache.” Specialists of all types - otolaryngologists, allergists, neurologists, internists, and emergency physicians are confronted almost daily with these patients. 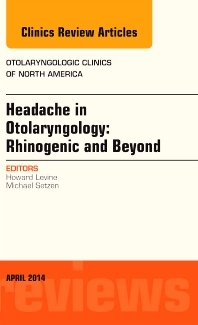 “Headache in Otolaryngology: Rhinogenic and Beyond” describes headaches ascribed to other causes - migraine as well as headaches that actually are a result of sinusitis. This volume addresses the need for expertise of an otolaryngologist who can obtain a history of nasal and sinus disease, evaluate the interior of the nose, and correlate it to a computed tomographic (CT) scan, along with collaboration of neurologists/headache specialists. Because headaches are often a symptom of potentially dangerous medical conditions that may need emergency work-up and referral to the appropriate physician, information in this volume identifies these emergency conditions for the clinician. Topics include: Confusion about sinus headache; Diagnosing Adult and Pediatric Headache; Imaging for the headache patient; TMJ head pain; Signs of dangerous headache; Vertiginous headache; Rhinogenic headache; Medical treatment of headache; and Surgery for headache.